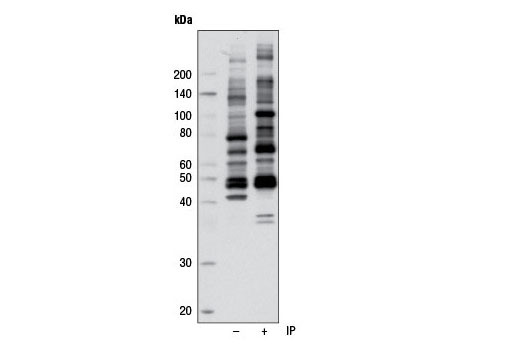 Western blot analysis of extracts from serum-starved NIH/3T3 cells, phosphorylated in vitro with Akt kinase, or treated in culture with PDGF or FBS/Calyculin A, using Phospho-Akt Substrate (RXXS*/T*) (110B7E) Rabbit mAb. 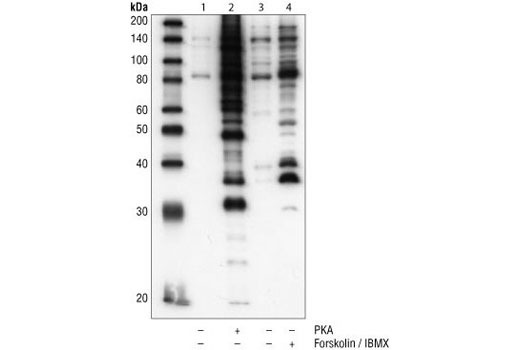 Western blot analysis of extracts from serum-starved A431 cells, phosphorylated in vitro with PKA kinase or treated in culture with forskolin/IBMX, using Phospho-PKA Substrate (RRXS*/T*) (100G7E) Rabbit mAb. Lysis buffer: 1.0% Triton X-100 (lanes 1 and 2), 2.0% SDS (lanes 3 and 4). Phospho-ATM/ATR Substrate Motif [(pS/pT) QG] MultiMab™ Rabbit mAb mix. 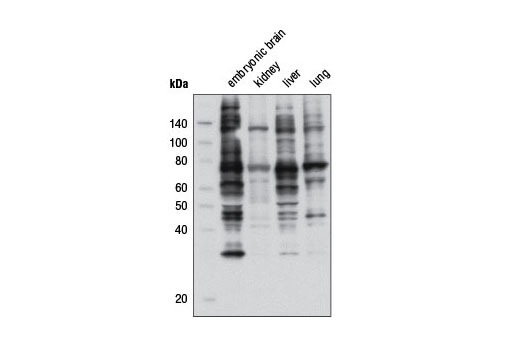 Western blot was imaged using Odyssey® Infrared Imaging System (LI-COR® Biotechnologies). 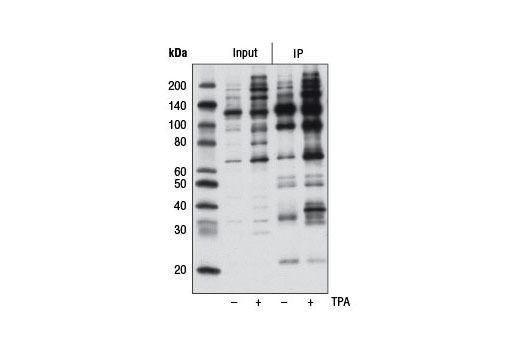 Western blot analysis of extracts from Jurkat cells, untreated (-) or TPA-treated (200 nM, 30 min; +), using Phospho-PKC Substrate Motif [(R/K)XpSX(R/K)] MultiMab™ Rabbit mAb mix. Western blot was imaged using Odyssey® Infrared Imaging System (LI-COR® Biotechnologies). Phospho-AMPK Substrate Motif [LXRXX(pS/pT) MultiMab™ Rabbit mAb mix. 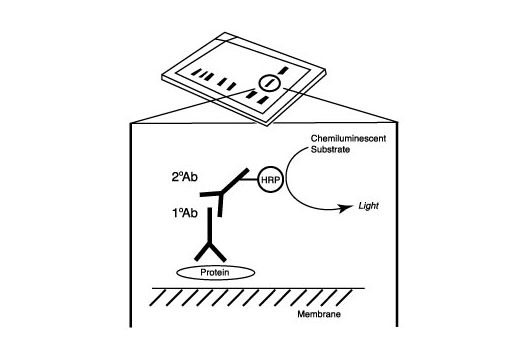 Western blot was imaged using Odyssey® Infrared Imaging System (LI-COR® Biosciences). 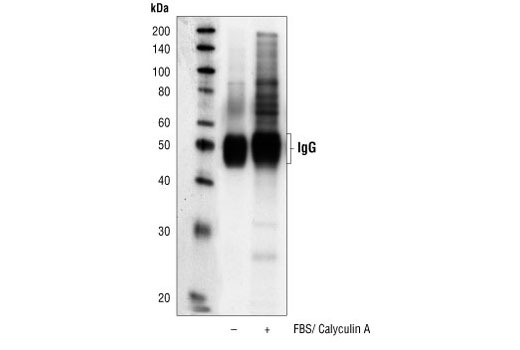 Immunoprecipitation of extracts from serum-starved NIH/3T3 cells, untreated or treated with FBS/Calyculin A, using Phospho-Akt Substrate (RXXS*/T*) (110B7E) Rabbit mAb, followed by Western blot analysis using the same antibody. Phospho-ATM/ATR Substrate Motif [(pS/pT) QG] MultiMab™ Rabbit mAb mix (lanes 3 and 4). Lanes 1 and 2 show 10% input. 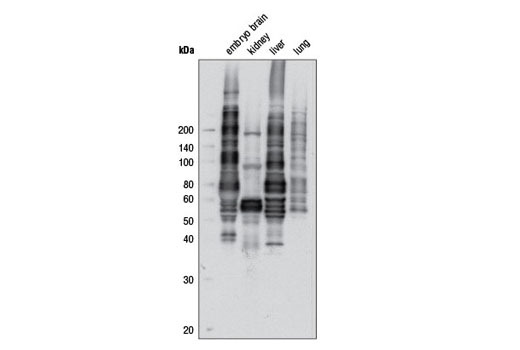 Western blot detection was performed using the same antibody (upper) and p95/NBS1 Antibody #3002 (lower). 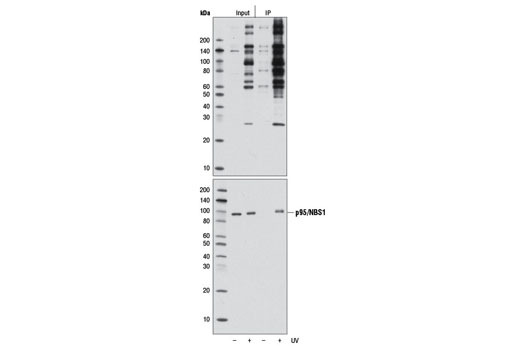 Western blot analysis of extracts from various mouse tissues using Phospho-PKC Substrate Motif [(R/K)XpSX(R/K)] MultiMab™ Rabbit mAb mix. Immunoprecipitation of extracts from H1650 cells using Phospho-AMPK Substrate Motif [LXRXX(pS/pT) MultiMab™ Rabbit mAb mix. Lane 1 shows 10% input. 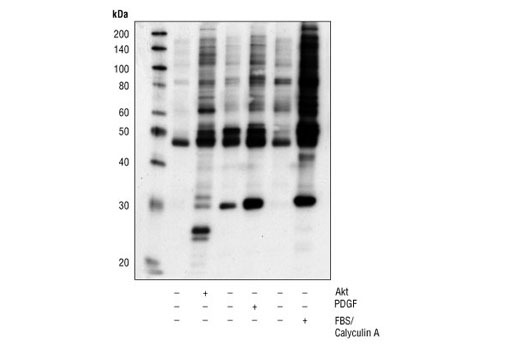 Western blot analysis was performed using the same antibody. 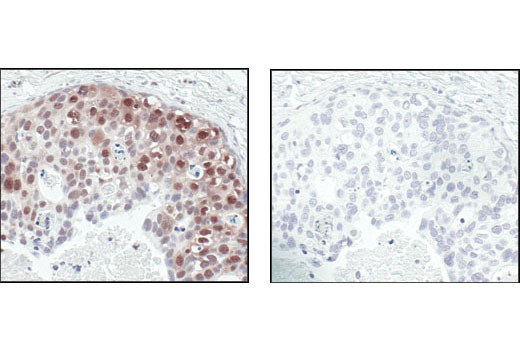 Immunohistochemical analysis of paraffin-embedded human breast carcinoma control (left) or lambda phosphatase-treated (right), using Phospho-Akt Substrate (RXXS*/T*) (110B7E) Rabbit mAb. Immunoprecipitation (IP) of extracts from Jurkat cells, untreated (-) or TPA-treated (200 nM, 30 min; +) (lanes 3 and 4), using Phospho-PKC Substrate Motif [(R/K)XpSX(R/K)] MultiMab™ Rabbit mAb mix. 10% input is shown in lanes 1 and 2. 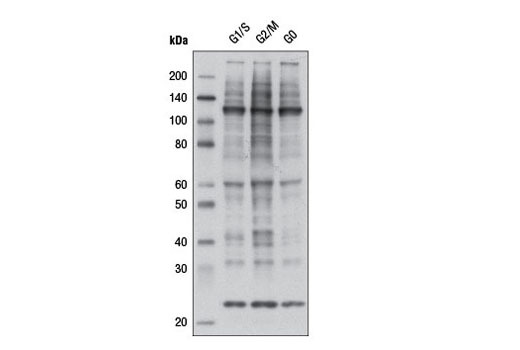 Western blot analysis was performed using the same antibody. 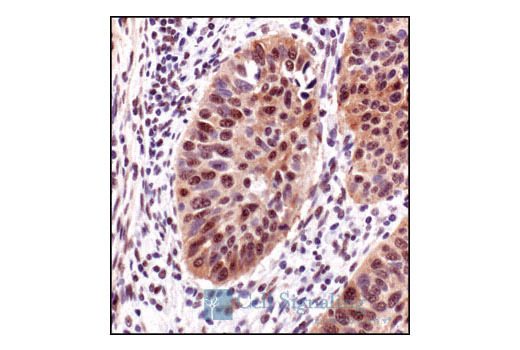 Immunohistochemical analysis of paraffin-embedded lung carcinoma, using Phospho-Akt Substrate (RXXS*/T*) (110B7E) Rabbit mAb. 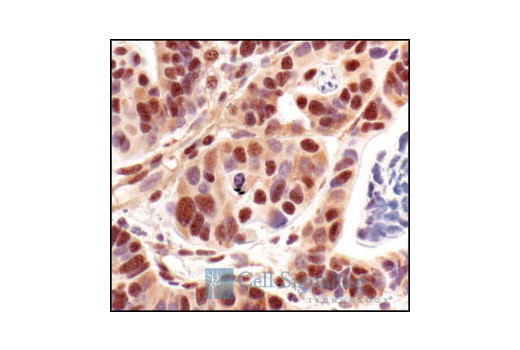 Immunohistochemical analysis of paraffin-embedded renal cell carcinoma, using Phospho-Akt Substrate (RXXS*/T*) (110B7E) Rabbit mAb. 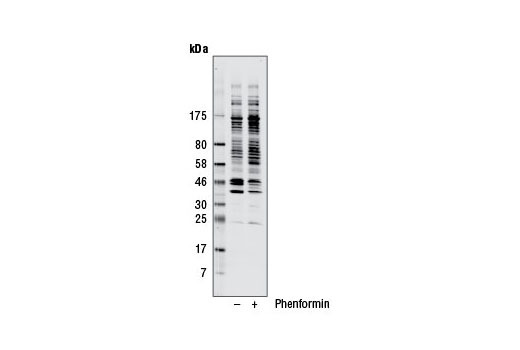 The Phospho-(Ser/Thr) Kinase Substrate Antibody Sampler Kit provides an economical means to investigate the downstream activity of select serine/threonine kinases. The kit contains enough primary antibody to perform two western blot experiments with each antibody. by arginine at positions -5 and -3, in a manner largely independent of the surrounding amino acid sequence. Some cross-reactivity is observed for peptides that contain phospho-serine/threonine preceded by arginine at position -3 . No cross-reactivity is observed with the corresponding nonphosphorylated sequences or with other phospho-serine/threonine-containing motifs. By ELISA, the antibody recognizes a wide range of peptides with phospho-threonine or Phospho-serine with arginine at -3 and -5 position. Phospho-(Ser) PKC Substrate (P-S3-101) Rabbit mAb detects endogenous levels of many cellular proteins only when phosphorylated at Ser residues surrounded by Arg or Lys at the -2 and +2 positions. The antibody may also cross-react with S*X(R/K) motif-containing proteins. The antibody does not cross-react with nonphosphorylated Ser residues, phospho-Thr in the same motif, or phospho-Ser in other motifs. 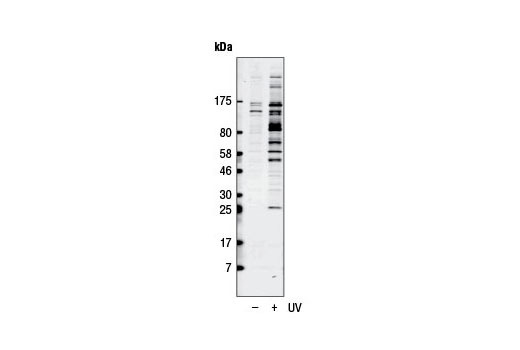 Phospho-PKA Substrate (RRXS*/T*) (100G7E) Rabbit mAb detects peptides and proteins containing a phospho-Ser/Thr residue with arginine at the -3 and -2 positions. It is a useful tool in identifying new substrates of PKA. The antibody recognizes other -3 arginine-bearing phospho-Ser/Thr peptides, such as substrate motifs for Akt and PKC, to a lesser extent. It does not recognize the nonphosphorylated substrate motif peptides. Phospho-(Ser/Thr) AMPK Substrate (P-S/T2-102) Rabbit mAb preferentially recognizes endogenous proteins and peptides bearing the LXRXXpS/pT motif. The antibody also cross-reacts with proteins and peptides that only harbor an RXXpS/pT motif. Phospho-(Ser) CDKs Substrate (P-S2-100) Rabbit mAb rec- ognizes phospho-serine in a KS*P motif. The antibody does not cross-react with phospho-threonine or phospho-tyrosine containing peptides/proteins. 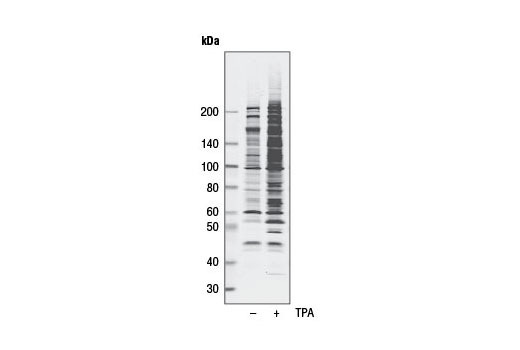 Phospho-(Ser/Thr) ATM/ATR Substrate (S*/T*QG) (P-S/T2-100) Rabbit mAb recognizes proteins containing phospho-Ser or phospho-Thr followed by Gln and Gly residues. To some extent, this antibody also recongizes proteins with an S*/T*Q motif. Monoclonal antibodies are produced by immunizing animals with synthetic phosphopeptides . Phospho-(Ser/Thr) kinases and phosphatases play critical roles in a wide range of biological processes. Each phospho-(Ser/Thr) kinase phosphorylates serine or threonine within a specific motif. Akt phosphorylates substrates at a serine or threonine only in a conserved motif characterized by arginine at positions -5 and -3 (1). Conventional PKC isozymes phosphorylate substrates containing serine or threonine, with arginine or lysine at the -3, -2 and +2 positions, and a hydrophobic amino acid at position +1 (2,3). A consensus phosphorylation site of PKA is serine or threonine with arginine at the -2 and -3 positions (3). AMPK phosphorylates consensus motif (L/M)XRXX(S/T)XXXL (6). Antibodies recognizing the LXRXX(S/T) motif are very useful in the identification of AMPK substrates. The consensus amino acid sequence for CDK substrate is (K/R)(S*)PX(K/R), where denotes any one of the 20 amino acids and S* is the phosphorylation site (4-6). ATM and the related kinase ATR phosphorylate serine or threonine in an S*/T*Q motif (7,8). Antibodies specific to particular kinase substrates are invaluable reagents in determining kinase activity and identifying potential new kinase substrates. CST has developed antibodies that recognize phosphorylated serine or threonine within the context of a protein motif that is phosphorylated by Akt, PKC, PKA, MAPK/CDK, CDKs or ATM/ATR. As shown by peptide pairing ELISA, each phospho-(Ser/Thr) kinase substrate antibody in this sampler kit is specific to its kinase substrate motif. Nishikawa, K. et al. (1997) J Biol Chem 272, 952-60. Xu, W. et al. (2003) Cancer Res 63, 7777-84.